With the arrival of summer, VisitandCare.com today reported a dramatic increase in men seeking cosmetic surgery and hair transplant procedures, up 80 percent from July of last year. With such an expansive range of medical tourism destinations, the company is helping patients take advantage of exceptional plastic surgery costs and achieve the look they have always desired. Continuously motivated to be renowned as the top name in the medical tourism industry, VisitandCare.com is comprised of the most progressive and sophisticated cosmetic surgeons and hair transplant specialists in the world. The company offers exceptional surgical treatments for men, including mustache, beard and hair transplants; the much sought after eyelift, eyelid surgery and neck lift procedures; laser hair removal, body contouring and liposuction procedures; and the pioneering abdominal shaping surgery — to name a few. In a society where youthfulness and desirability are held in high regards, men are seeking medical procedures not only for the ins and outs of self-importance, but to feel more competitive in the professional marketplace. Men are taking great interest in anti-aging, fashion, and individuality — traits that are perfectly embodied in the world-class destinations being offered at VisitandCare.com — including Turkey, Mexico, Belgium, UK, and South Korea. 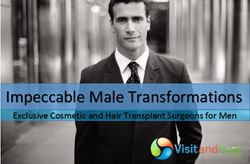 Statistics from VisitandCare.com show that the number of men undergoing cosmetic surgery and hair transplantation procedures increased approximately 300 percent between the years of 2011 and 2014. From state-of-the art modern hospitals to luxurious accommodations in select locations, the impeccable male transformation is now an upward trend. More and more men are feeling an exaggerated dissatisfaction with their appearance — typically detailing disappointment in their body physique, hair loss, and masculinity. As a world-wide phenomenon, the fast-growing market for cosmetic procedures now draws male baby boomers. According to the American Society of Plastic and Reconstructive Surgeons men spent almost $130 million on liposuction, face-lifts, and eyelid surgery combined in 1997 — up from $88 million in 1992. Today, cosmetic surgery and hair transplant procedures promise quick and painless high-tech results — and the gift to make men feel more attractive, powerful, and masculine. The company says it is likely that more men will undergo cosmetic surgery abroad in the future, especially as advanced technology shortens recovery times and the procedures become more affordable. Improving Patients Lives the company provides access to exclusive doctors and hospitals who specialize in infertility, plastic surgery, cosmetic dentistry, laser eye surgery, orthopedic surgery, hair transplantation, weight loss surgery, heart surgery and cancer care. Patients are matched with devoted multilingual patient facilitators and provided tangible connections to doctors worldwide. Promoting Your Healthcare Brand for the ultimate connection between the healthcare industry and patients worldwide, the company delivers an unrivaled commitment to create sustained value for medical partners. Contact VisitandCare.com to see if you are eligible to become a partner of the exclusive network.